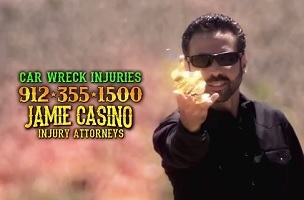 This is without a doubt the most metal personal injury commercial of all time. Oh, the ambulance chaser in your town has some iMovie effects and a nice suit? Jamie Casino’s got murder, vengeance and a flaming sledgehammer. Welcome to Casino’s Law, hold on to your f*cking dicks. If you share this on Twitter or Facebook, be sure to hashtag it with #CasinosLaw.